The RareConnect website is a partnership of NORD, a U.S. National Organization for Rare Disorders, and EURORDIS, a non-governmental patient-driven alliance of patient organisations and individuals active in the field of rare diseases. The purpose of this website is to connect rare disease patients globally. The website itself is a place where sufferers, sufferer organizations, and those related can join to communicate, as well as being a one-stop place to learn about the disorders. We are happy to say that trimethylaminuria (TMAU) is one of the disorders that has a place in this site for our international community. 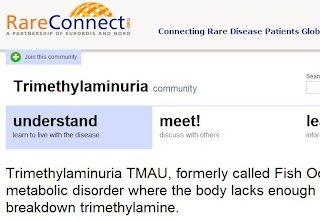 Trimethylaminuria (TMAU) pages on Rare Connect website. All sufferers and sufferer organizations are welcome to register and become a member of this site that offers a wide web of connections with rare disease sufferers throughout the world, language services, news on community services, political connections and endeavors, special projects, and much more. You may choose whichever language you are most comfortable with, such as German, English, Spanish, French, or Italian to register. Please feel free to write your personal testimonial if you like, under the "Call for stories" article written by the RareConnect team. Stories can be submitted anonymously to webmaster@rareconnect.org. 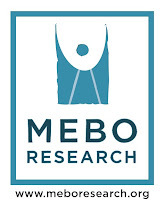 Please note that this is not a MEBO Research site, though MEBO is a NORD Organization Member and a RareConnect member, and all the currently registered patient groups look forward to uniting with the rest of our international community's sufferer organizations, forums, and individuals wishing to get together under the hospice of these two great organizations through RareConnect. So please do register individually or under your organization's name.